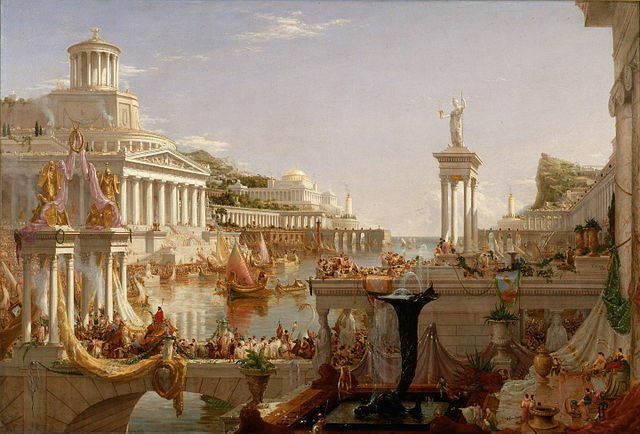 Studying Ancient Rome and looking for a great integrated art program? Maybe your family has touched on some topics about Rome, and you would like to round out his or her knowledge. Or perhaps your co-op needs a great art unit for next semester, or your family is looking for activities to do together over a school break. Whatever the reason, welcome to Take Time for Art’s Ancient Rome, an integrated hands-on art history video course! In each of our units you can expect great history told in story with great art history images and hands-on projects. We put the visuals on history. That means when we study about the the Roman Empire, we show images of characters from Ancient Rome painted and sculpted down through the history of art as we tell the story. We also link back to our own history as Americans and talk about how the Roman Republic influenced our founding fathers. And we cover the time periods from before the the rise of Rome to about 450 AD. That means we cover about 1000 years of history and try to touch on most of the major events, not to mention the great art! And we also have the privilege of teaching from a Christian worldview so we get to cover the birth and death of Christ and how Christianity changed the world. While we won’t cover everything thing that happened during the Roman Empire, we like to give a broad overview as we look at the wonderful art and history. But we do more than just look at great art. At Take Time for Art we make real art based on real art. That means that in Take Time for Art’s Ancient Rome when we look at the beautiful Roman mosaics around the time of Pompeii, we then make a mosaic. In addition, we offer simple and more complicated versions so that most of your family can participate at their level. And almost all of the materials are included in our wonderful materials kits. We get that you are busy and that’s why we offer our materials packs. We know there is nothing more frustrating than having a great activity planned and realizing that you forgot to buy __________! It’s always something when you are a busy family. That’s why we include almost everything but simple things that you probably already have such as scissors and glue. We want hands-on art history to be easy and fun for you and your family. We work best for ages 8 or 9 and up. That means that if you have a third grader or higher, we’ve got you covered! And did you know you can even use our programs for high school credit? Just do two of our units, keep track of your hours, and encourage your student to try the more complicated projects. This should comprise about 60 hours of work or .5 units of high school elective credit for art. Have more questions? Check out our FAQs. Take a look at our product page for more information about Ancient Rome. We have a preview video and information about pricing. Want free shipping? Just purchase three art materials packs or more and automatically get free shipping! So once again, welcome to Take Time for Art’s Ancient Rome! We truly want to help you bring hands-on art to your family and make it relevant, fun, and fascinating. Plus we teach from a Christian world view. It’s a good day to Take Time for Art.